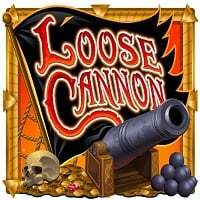 Try the Loose Cannon slot for free! No registration and no download required. Drink all the rum, use your maps, and find the hidden treasure in this pirate themed online slot. So let’s go on an adventure! Ahoy matey! What are you after, if you’re a pirate? Arrrr the treasure, of course. In the Loose Cannon slot, it’s no different, because the highest paying symbol is the treasure chest. The other paying symbols are the treasure map (useful to find some treasures, isn’t it? ), some rum (also necessary), and of course, the double pistols to shoot your way out of a tight spot. In the Loose Cannon slot the wild symbol is the pirate ship, which can substitute any other symbol (except the scatter) to help you get those winning combinations in a heartbeat. The scatter symbol is a compass with an octopus on it, which will get you to the free spin mode for some nice prizes. In the Loose Cannon slot you’ll need 3 or more scatter symbols to get into the free spin mode, which will award you with 15 free spins. Free spins can be retriggered too! It will give you some great treasures, I’m sure! The Loose Cannon slot game offers one bonus game, called Wild Cannon. If you land a wild symbol on the third reel, it will turn the whole reel wild. Furthermore, some pirate ships will appear and shoot cannon balls in the air. Some of them will hit other symbols, turning them wilds in the process. You can play with real money in the Loose Cannon slot game too. The minimum bet is £0.30, while the maximum is £37.50.